Routing of a new gondola planned for Bretton Woods will give riders excellent views of the famous Mt. Washington across the way. Pending government approval, one of the closest ski resorts to Mt. Washington and its famous cog railway will open a 6,000-foot base-to-summit gondola in 2018. Bretton Woods’ director of ski operations Chris Ellms appeared before a local planning board last night to unveil plans for the all-season lift and a new summit lodge. The relatively low-capacity gondola will circulate 36 8-passenger cabins, making it the largest gondola in the state by cabin size. Loon Mountain’s gondola seats only four. Both the Bethlehem Express quad and Fayban’s Express triple chair will remain in place for winter skiers but the 1,300 vertical-foot gondola will spin other seasons as well. Fayban’s top terminal will be moved downhill to make room for the gondola station and the new lift will cross over Bethlehem. Ellms said the approximately five minute gondola ride will serve skiers, sightseers, hikers, diners and wedding parties. 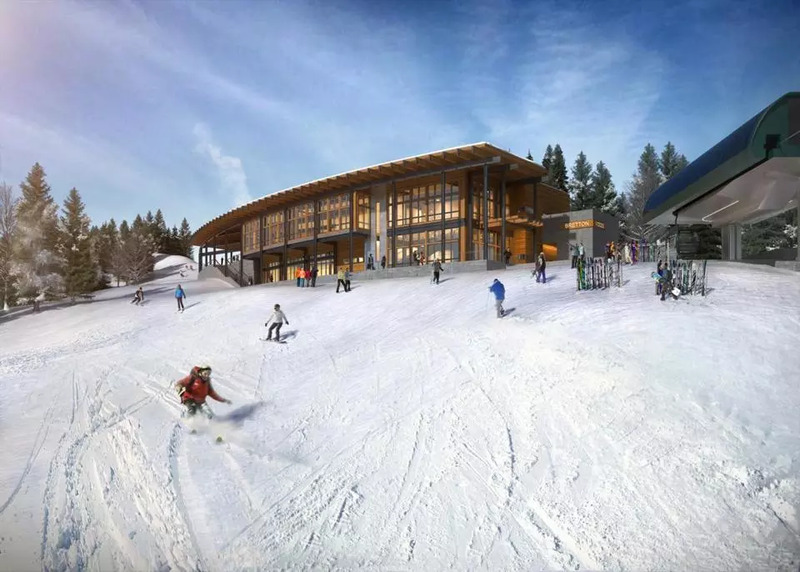 “What we are proposing is it is not all about skiing, it is what the resort is about which is four seasons.” Total project cost for the gondola and new restaurant is approximately $15 million and Bretton Woods’ owner, Omni Hotels & Resorts, hopes to open the new lift next ski season. The mountain’s current fleet includes mostly Doppelmayr and Garaventa CTEC lifts, though a manufacturer for the new gondola was not named. The last complete gondola installed in New England was the K1 Gondola at Killington, installed by Poma in 1997. A new gondola at Bretton Woods (aka Medicare Mountain because of its lack of expert terrain) would be a huge deal (and also a huge marketing scheme considering the low capacity offered by only 36 cabins). It would also attract more I-93 skiers towards Bretton Woods, potentially spurring on lift investments at other nearby mountains (Loon & Waterville). This could be very similar to what Crystal Mountain, WA did in 2010. By retaining the original lifts to back up the gondola in case of a closure (likely due to wind), Bretton Woods will still have high capacity lifts serving the same area. In other words, the gondola would not be Bretton Woods’ workhorse lift, similar to how the Mt. Rainier Gondola is not Crystal Mountain’s workhorse lift). My only concern about a gondola at Bretton Woods is WIND. Being next to Mount Washington (which holds the record for highest recorded wind speed on earth), the prevailing winds (West – Northwest in the winter) would sweep across the mountain and the gondola’s lift line, which would close the lift often. Waterville Valley has also had a gondola planned for some time that would go from downtown Waterville Valley to the top of Green Peak, with an angle station at the bottom of a new trail pod on the east face of Green Peak. Bretton Woods almost never has wind holds. They even advertise it. Belleayre is installing a gondola this season and it looks like it will be finished in 6 months to give an idea of how long it takes. First gondola installed in the northeast since 2006 when Stowe put in Over Easy and first skiable gondola in the northeast since 1999 when Gore and Whiteface installed their gondolas. 36 cabins would give it a capacity around 1200 an hour. Belleayre’s gondola is a little bit longer and has 60 cabins and can carry 2000 skiers an hour. Also they mention 6000 feet long and a 5 minute ride time which means this one will be able to run 1200 fpm, outseating Wildcat for having the fastest lift in NH. As far as this spurring other lift upgrades, I think Loon will replace their gondola soon. The current one only fits 4 people per car and has less capacity than a double chair. And they are the closest big ski area to Boston so they get very crowded. True on BW’s claim to least wind holds as of now. However, the height of the towers at the crossover of the Bethlehem Express of the proposed Gondola will create a wind old issue for sure. Add to that the greater cross section of the Gondola cabins and you’re all but sure of getting wind holds on it. Loon has talked about replacing the Gondola but I wouldn’t hold my breath on that. They haven’t even been able to get the financing to finish up South Peak with the learners pod and new public access at the bottom of it. I would argue Loon needs that teaching terrain long before they need a new Gondola. A replacement will be pricey, they got away on the cheap with the current as they were able to reuse the tripod towers. Doubt they could with a larger capacity lift and the likely wider gauge for an 8 pax may give issues with the Octagon base. About the Loon Mountain beginners pod: The hold up is more about the financial standing of the South Peak Resort not Loon Mountain Rec Corp. The SP Resort is the unfinished development of homes and townhouses build between the river and South Peak ski trails and it’s gone through at least three owners since the land was sold by Booth Creek to finance the first lift construction on Loon’s South Mountain. The beginner pod will be based on SP Resort land and planning and construction will require a partnership between them and Loon. As SP Resort has been experiencing difficulties and is yet again for sale, they have not been willing to participate in any partnership for the construction of the beginner pod. Loon has potentially four lift projects that could be done in the near future. The two quads at the South Peak beginner complex, a pulse gondola from Riverwalk to the said complex (which would be the first such lift in the Northeast), and of course the replacement gondola. According to Peter, Boyne is incredibly unpredictable. They often make these big announcements like Sugarloaf 2020, Big Sky 2025, among others and then don’t follow through on them. Back to Bretton Woods, I wonder if relocating the Fabyan’s Express top terminal will make it so you can’t access some stuff off that lift that you can now. That would force more people to use the gondola, likely creating long lines. Although no manufacturer has been announced I assume they’ll go with Doppelmayr considering that nearly all of New Hampshire’s lifts are Doppelmayr or Garaventa CTEC. There were only four new installs of Poma lifts in NH. White Peaks at Waterville, 6-pack at Ragged, and Sunapee Express and Clipper Ship at Sunapee. I’m not counting the Sun Bowl Express or its predecessor because both were hand-me-downs from Okemo, so they just used whatever was available. However, if LP outbids Doppelmayr by a large margin, I think they’d take it. Gondolas are way more expensive than chairs due to having to buy the cabins which cost 40k a piece. Also, the loading platforms are expensive to build because they need to be heated concrete or you get a slippery, sloppy, salty mess. This is going to be the biggest investment Bretton Woods will likely ever see, and they will spend their money wisely. When I was referring to the last complete gondola in New England, I was referring to new gondolas that serve skiable terrain (not as a base-to-base transfer lift), and in a New England state (Whiteface and Gore are in New York, so I didn’t count them), making K1 the most recent skiable gondola in New England. 1200 skiers per hour is still a low capacity lift not matter what way you put it. At 1200 fpm and only 1200 skiers per hour, it sure sounds like a marketing scheme to me (if it is then they’re geniuses). Bretton Woods’ wind hold claim may be true now, but it will not be if they install a gondola. As of now, most of Bretton Woods’ lifts are low and not very exposed, but the gondola will have to be, most notably at the point where it crosses the Bethlehem Express. Once an 8 passenger cabin, with all its windage, gets into that area, the lift will experience wind closures. As for Loon, they will likely replace their gondola soon, but I don’t think there will be a significant capacity upgrade considering the limited number of runs down from the gondola (a double and a detachable quad also access most of the terrain). The equipment (notably the DS-104 grips and CLD-260 era terminals) is aging, and the 1966 Hall towers couldn’t possibly be reused again. As for congestion at the base area, the only real solution (without overcrowding trails on Loon Peak) is to expand and utilize the growing South Peak area and its proposed beginner complex. As for “Boyne’s unpredictability”, the unpredictability is more common in the east than you would think. Waterville Valley, NH had Green Peak, its first expansion since the 1960s, planned for over 20 years before a scaled down proposal was approved and Waterville had the money to expand. In 1975, Bretton Woods expanded too quickly and quickly became the largest bankruptcy in the history of the state of New Hampshire at the time. The Balsams, NH has been planning to break ground for five years, and nothing has happened yet. Saddleback, ME has been very unpredictable as of recently and didn’t even open last year, and likely won’t open this year. Mount Sunapee, NH has had its West Bowl expansion on the table for 20 years, and has gotten nowhere with it. Jay Peak, VT has also had its West Bowl project planned for years as well as the Powerline Six-Pack, both of which have seen no progress. The Killington – Pico interconnect has been planned since 1996, and only a groomer road has ever been cut. You can’t just accuse Boyne of being unpredictable, because loads of other mountains in the east do the same thing. I don’t know enough about the history of midwest and western mountains to make the same argument, but I’m sure they all do it too (Vail however makes their plans very clear, just as they did recently). My theory is that the only mountains in the east that can / have the money to invest in lifts and new terrain are the ones that get 400,000+ customers per year. Okemo, VT and Mount Snow, VT have seen significant investment in lift infrastructure in recent years because they have the customer base and the money to afford it. CNL Lifestyle Properties, which owned many of these major New England ski areas (including but not limited to Loon, Sunday River, and Sugarloaf, all Boyne resorts), wanted out of the ski business for years before they finally sold, and in those years, lift investment at major resorts came to a grinding halt. Now that new owners have taken over, I think significant new lift investment is on the horizon for ex-CNL mountains, and Bretton Woods may be just the first example (it was the first CNL owned mountain in NH to be sold in 2015). 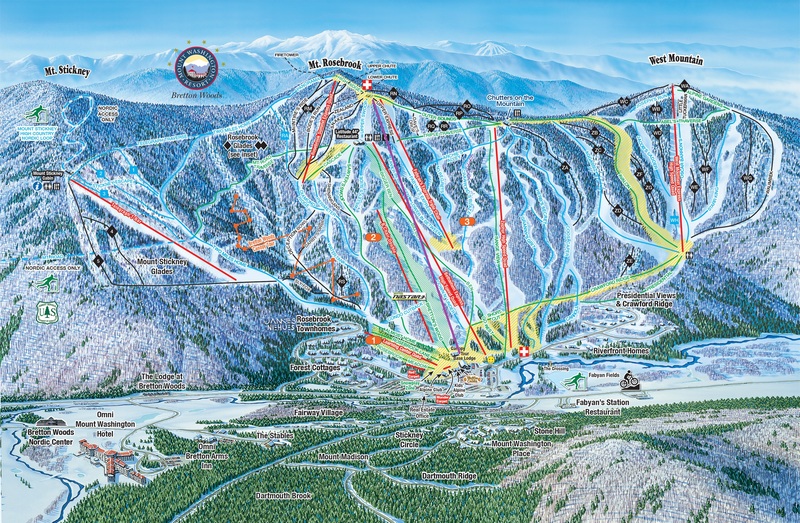 Now if the current timeline holds and Bretton Woods does install a new gondola in 2018, we can make a rough prediction that other ex-CNl mountains that were part of the mass sell off in 2016 could see significant new lifts by 2019 (excluding Sunday River’s Spruce Triple, which was installed to replace a damaged lift). Also, my bet is that Bretton Woods will go with Doppelmayr, unless L-P outbids Doppelmayr by a lot. My thoughts? offer some mid week deals that don’t involve buying a season pass. stop insulting the older skiers by offering a pass to the 20 somethings (loon) with no blackouts for less than the midweek pass. I realize the cost of these modern lifts is very high but midweek it’s not crowded. many skiers only want to ski 4 or 5 runs. charge accordingly . there is an untapped market of the occasional skier out there. New rendering of the gondola and lodge. No D-Line.